The MStore stock management module provides multi-location stock control for the retail, ticketing and hospitality EPOS functions. 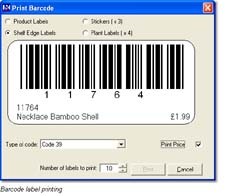 Multiple bar codes per PLU can be set up to cope with product variations ie colour/size/style and to limit the number of PLUs required. The module contains a purchase ordering system which allows automatic re-order criteria to be set up. 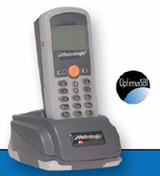 Costing can be done by standard, average and latest costs. For the catering environment, recipe, ingredient and menu costing can be controlled and food order options added to PLUs. The system provides rapid entry of stock receipts and bulk entry of new stock lines from the same supplier. 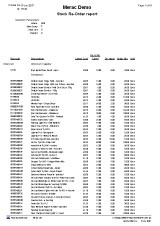 Online purchasing is now offered by many suppliers. MStore allows you to automatically generate purchase orders based on stock levels and stock profile and to send them electronically to your suppliers. Goods-in processing is also automated when using purchase orders. 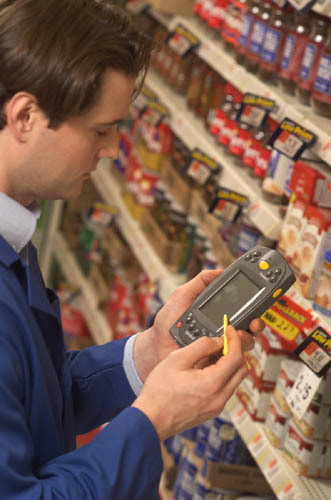 Stock Take time is dramatically improved and a lot more accurate when using hand held scanners. These can also be used for goods in..
Bar Coded product labels can be printed with their own codes for items that do not have a manufacturer's bar code. All of the reports you would expect including Stock Valuations, Stock Transaction Reports, Top Movers (and slow movers) Analysis and various Purchase reports. Each report has a range of parameters to allow you further flexibility, and to allow you to use the system in the way that You want to control your stock.